As the St. Croix logging industry center, the Boom Site bustled with activity beginning in June and ending when all of the logs were sorted from the river, usually in August but sometimes as late as October. At the height of operations, around 600 laborers walked the logs on the river in calked books, bearing pikes and peavies, and engaged in the work of catching, sorting, marking, and measuring logs. In 1902, they earned $1.75 per day. Boom Site accommodations were much the same as at any logging camp. Men lived in cramped bunk shanties and ate for free at the cook house while working long hours. 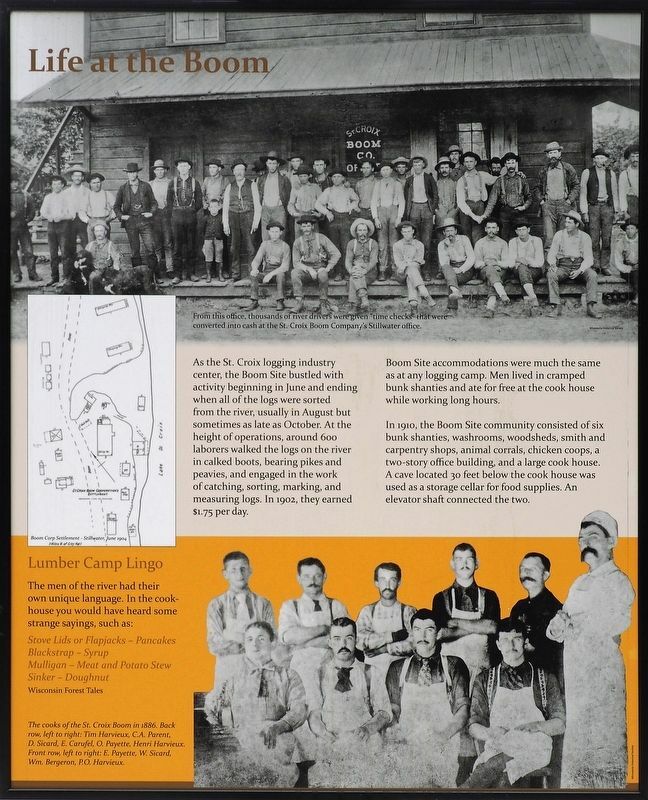 In 1910, the Boom Site community consisted of six bunk shanties, washrooms, woodsheds, smith and carpentry shops, animal corrals, chicken coops, a two-story office building, and a large cook house. A cave located 30 feet below the cook house was used as a storage cellar for food supplies. An elevator shaft connected the two. From this office, thousands of river drivers were given "time checks" that were converted into cash at the St. Croix Boom Company's Stillwater office. Erected by Minnesota Department of Natural Resources, National Park Service. Location. 45° 5.103′ N, 92° 47.145′ W. Marker is in Stillwater, Minnesota, in Washington County. Marker can be reached from Saint Croix Trail North (State Highway 95 at milepost 101). Touch for map. The marker is on the plaza at the south end of the parking lot. Marker is in this post office area: Stillwater MN 55082, United States of America. Touch for directions. Other nearby markers. At least 8 other markers are within 3 miles of this marker, measured as the crow flies. Controlling A River Of Logs (here, next to this marker); Geology of Minnesota (approx. 0.4 miles away); Tamarack House (approx. 1.4 miles away); The Warden's House (approx. 1.9 miles away); St. Croix Lumber Mills / Stillwater Manufacturing Company (approx. 2 miles away); 1965 Easter Sunday Floodwater Crest (approx. 2.1 miles away); 114 North Main Street (approx. 2.2 miles away); 1884 Upper St. Croix River Log Jam (approx. 2.2 miles away). Touch for a list and map of all markers in Stillwater. More. Search the internet for Life at the Boom. Credits. This page was last revised on March 18, 2019. This page originally submitted on March 16, 2019, by McGhiever of St Paul, Minnesota. This page has been viewed 75 times since then. Photo 1. submitted on March 16, 2019, by McGhiever of St Paul, Minnesota. • Bill Pfingsten was the editor who published this page.